In this blog for our Evidence for Everyday Health Choices series, dentist Bosun Hong writes about the latest evidence on the use of chlorhexidine mouthwash in addition to toothbrushing for gum health. I am a 5.2 foot, petite, female dentist. I currently work in an oral surgery department where I spend a lot of my time taking teeth out and the frequently asked question is, “have you got enough strength in you to pull my tooth out?”. The truth is that often I feel my patients have done half the job for me by loosening their teeth with gum disease. The gum really is the foundation for your teeth. A lot of people fall on the spectrum of gum disease – somewhere between the more mild, reversible form (gingivitis) and the more severe, irreversible form (periodontitis). Gingivitis is when the gum becomes red and swollen and bleeds easily, but gets better when you start looking after your gum. If you fail to keep your gum happy, then your gingivitis may progress to periodontitis where you start to lose the structures that hold the tooth in place, such as the tooth-bearing bone. Your tooth-bearing bone will not naturally grow back once you lose it, and if you lose enough bone, the tooth becomes loose. At this point, my patients would ask, “so how can I look after my gum? Should I use that mouthwash that my dentist recommended? The one that starts with C”. 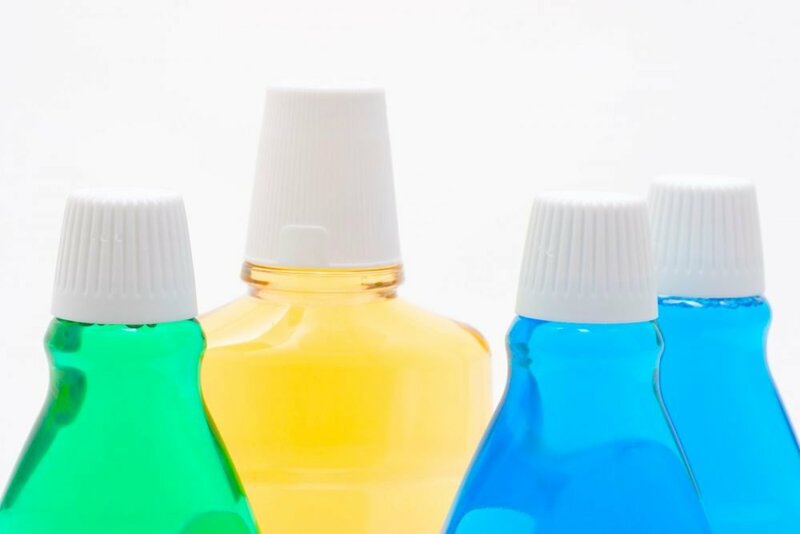 A recent Cochrane review looked at the effectiveness and side effects of chlorhexidine mouthwash. The mouthwash that starts with C – does it work? Chlorhexidine is an antiseptic against a broad spectrum of bacteria. The authors found high-quality evidence that short-term (4-6 weeks) and longer-term (6 months) use of chlorhexidine mouthwash in addition to usual toothbrushing and cleaning leads to a large reduction in the build-up of plaque. They also found this mouthwash is moderately helpful in improving mild gingivitis. There is currently insufficient evidence on the effectiveness of chlorhexidine mouthwash for people with moderate to severe gum disease. The authors investigated the effectiveness of chlorhexidine mouthwash when used in addition to mechanical oral hygiene regimen such as toothbrushing and cleaning between teeth. Sometimes, I see patients who feel a sense of betrayal from mouthwashes when they are told they have a gum disease; “why have I got gum disease? I use the mouthwash”. Often, these are people who have relied heavily on mouthwashes and underutilised the conventional methods of cleaning teeth. The importance of toothbrushing cannot be overemphasized – chlorhexidine mouthwash will not magically dissolve the sesame seed firmly stuck between the teeth, for example. 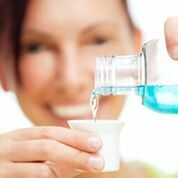 There are some specific circumstances where mouthwashes may have to play the main role in an oral hygiene regimen; after surgery (especially surgery involving the jaws) and in some individuals with intellectual and physical disabilities. Which concentration of chlorhexidine mouthwash should I use? You can buy chlorhexidine mouthwashes without prescription in the UK at the pharmacy. The most readily available concentrations in the UK are 0.12% and 0.2%. Does it matter which one you get? The authors of this review found no evidence that one concentration is more effective than the other. There are also lower concentration (0.05%/0.06%) chlorhexidine mouthwashes marketed for long-term daily use, but the authors found the effectiveness of this concentration on gingivitis to be unclear. The participants of studies included in this review were instructed to use the mouthwash twice a day. The authors could not find any other frequency being used. Until new evidence is found, it seems the generally accepted chlorhexidine mouthwash regimen is to swirl 10-15ml of it around the mouth for 30-60 seconds twice a day. Chlorhexidine mouthwash causes brown staining on the surface of teeth if used for 4 weeks or longer. This is a type of staining that comes off after scaling and polishing by a dental professional. Does the prospect of having chlorhexidine-induced teeth staining put you off from using this mouthwash? Are you now at a crossroads of vanity and healthy gum? Drinking tea can also cause a similar appearance of teeth staining; does this fact put you off from drinking tea, or would you rather continue to enjoy your Earl Grey five times a day? The key is moderation. If your gingivitis is mild and your oral hygiene could improve within a short period of time, then you may only need to use the chlorhexidine mouthwash for a couple of weeks and have no or little staining. 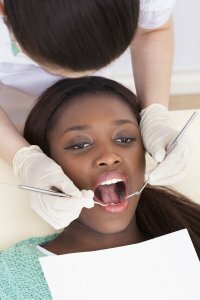 On the other hand, if your gum is bleeding every time you brush and you are finding it challenging to get used to the correct toothbrushing technique, then you may need to use the mouthwash a little longer and end up seeing a hygienist for the removal of some brown staining. It is also a case of standing back and looking at the bigger picture; some removable brown stains versus the appearance of neglected gum disease (fiery-red, swollen gum). Other side effects of chlorhexidine mouthwash include taste disturbance and soreness of mouth lining – these are transient in nature and usually resolve when you stop using the mouthwash. So, it seems chlorhexidine mouthwash would be a good addition to your oral hygiene routine (such as toothbrushing and cleaning between teeth) if you have gum disease. Look out for the signs of gum disease (red, swollen, bleeding gum) and ask your dentist to have a look inside your mouth first. Your dentist should be able to discuss the possible causes of your gum disease, decide together how long you need to use the mouthwash for, and whether you need any other gum treatment. Bosun Hong has no conflict of interest to disclose. Bosun Hong is a dentist with clinical experience in hospital settings primarily. She cares passionately about improving the efficiency of oral surgery provision in the UK. Her main research interest lies in the overlapping area of dental public health and oral surgery; the anaesthetic provision for patients undergoing dentoalveolar surgery. She has completed a Cochrane UK fellowship in 2016. As a dental member of the Cochrane UK & Ireland Trainees Advisory Group, she is committed to actively participate in promoting evidence-based practice for dental trainees. I must agree with your conclusion. While chlorhexidine is a good solution for gum problems, it’s also important not to overuse it.